Chefs Mario Carbone and Rich Torrisi serve up familiar Italian fare at this Greenwich Village hot-spot. 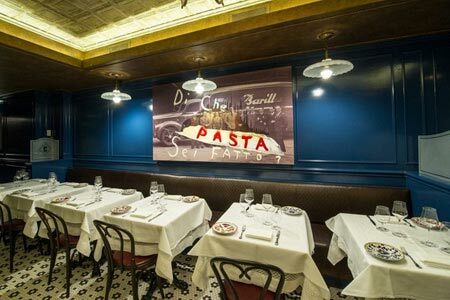 : Entering Carbone, one is transported back to the red sauce joints of 1950s New York City. With Frankie Valli supplying the soundtrack, the burgundy tuxedo-clad servers seem as if they've been traversing these floors for the last half-century. While the overpriced Manhattans are expertly mixed, the heavily Italian wine list offers depth (especially for those with deep pockets). 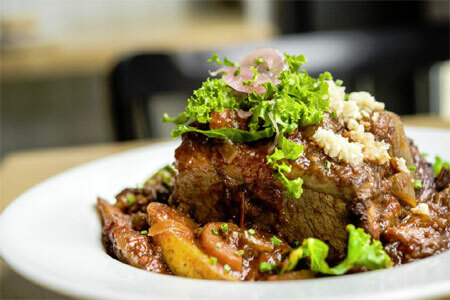 Menus the size of a tabletop list standard Northern Italian fare, all delivered with old-school flair. The bread basket is alone worth the visit. But there's much more: first-rate Caesar salads are made tableside, and linguine with clams is offered with three variations of chilies so guests can adjust the heat level to their liking. A hulking veal Parmesan might feed a family of four, and a grand lobster fra diavolo turns heads. For dessert, wait for the massive tray to be presented, where whirl-shaped carrot cake, topped with fresh carrot and ginger ice cream and showered in walnuts, and tiramisu are both standouts. This is deeply comforting food that would have the approval of even the choosiest Italian grandmother.